The Jumbies by Tracey Baptiste. Grades 4-6. Algonquin Young Readers, April 2015. 234 pages. Review copy provided by my local library. On Corinne’s island home, people often talk about the jumbies - evil spirits that live in the mahogany forests and cause trouble for people who cross their paths. There are the douens (dwens), spirit children that travel in packs and have backwards knees and feet. “If they know your name, they will call you and sound just like your mom or dad” and if they get you they’ll turn you into one of them. Soucouyant (soo-coo-YAH) are “old ladies who will take off their skin, leave it in a nice safe place, and then fly around in a ball of flame, sucking out people’s blood.” You may have woken up sometimes with soucouyant bites, only they look like mosquito bites so it’s hard to be sure. Corinne doesn’t believe in jumbies. She’s sure that they’re just tales people tell. But one day, some trickster boys steal her mother’s necklace and when Corinne goes to get it… something follows her out of the forest. 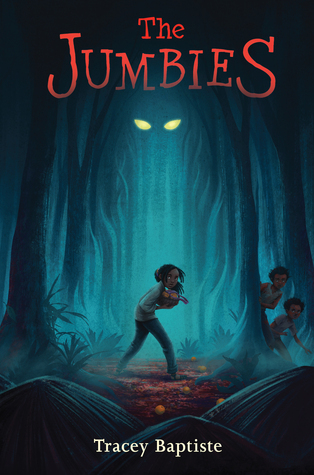 In The Jumbies, Corinne will face the worst jumbie anyone has ever seen on her island, a jumbie bent on taking Corinne and her father, a jumbie who will stop at nothing to get her revenge. I cannot wait to booktalk this book to students this fall. Scary books are always a hit and this one is a unique take with its island setting and its basis in Caribbean folklore and tales. The story was inspired by a Haitian folktale and incorporates legends that author Tracey Baptiste grew up with in Trinidad. At its heart, this is a story of friendship and family and finding the power inside you that you didn't know you had. As Corinne faces the jumbies that begin attacking her village, she's not alone. She bands together with a pair of trickster brothers and a new friend whom she met at the market. The four children support each other and each ends up being braver than he or she thought possible. Vivid sensory details bring the lush island setting to life as the adventure travels from the dark mahogany forests to the swamps to the beaches of the island. Small details such as the fish stews that Corinne cooks for her father and the fruits sold at the market place the action firmly in its setting in a very organic way. The blend of a strong friendship story with some creepy elements made me keep thinking about Doll Bones by Holly Black, which is another favorite creepy book that I like to booktalk.